It's no secret to those that know me, I love maps. Perhaps you've noticed, the other day I added an electronic guest book on the blog at the bottom of the right hand column. I enjoy thinking about places far away and learning about new locations, so it's been fun seeing where people are coming from. Today I spotted a vistor from the town of Carefree, Arizona. I had never heard of the town of Carefree, but it had such a pleasant name I decided to look it up. I immediately noticed something really funny - Carefree has some of the most interesting and fun street names I have ever seen. In addition to some fun western sounding streets like Bloody Basin, Sidewinder, and Long Rifle, there are others that are very serene: Lazy Lane, Nonchalant Avenue, Tranquil Trail, Easy Street. Fittingly enough, downtown will find you at the intersection of Ho and Hum. 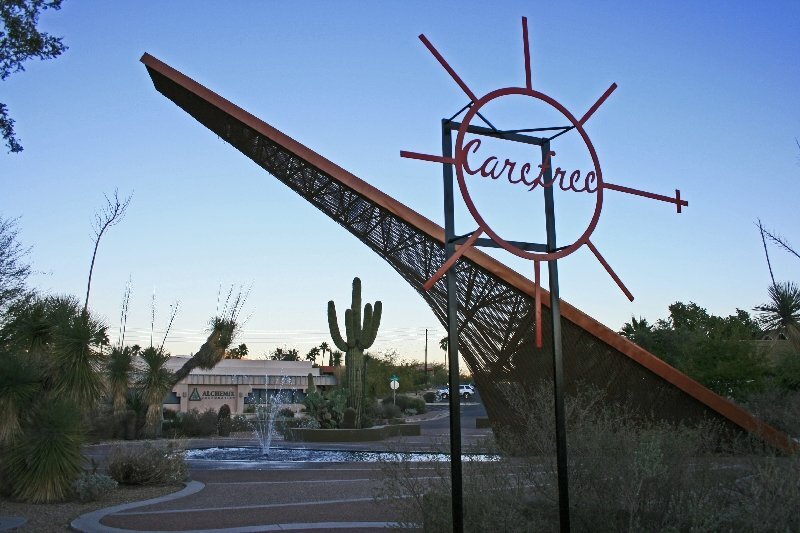 And like a good town from the Route 66 era, the city even boasts an attraction to bring in the tourists, namely the Carefree Sundial - billed as "The third largest working sundial in the Western Hemisphere." The qualifying term "working" made me smile. 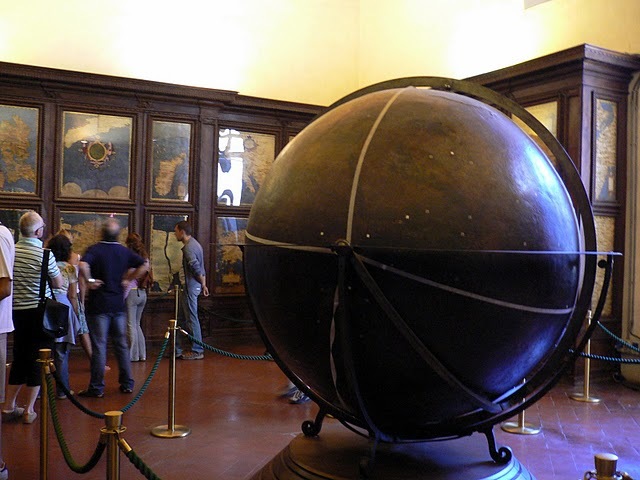 I wonder if there is a larger one that somehow just isn't "working" right now - and really does a sundial really do that much work? Neat site with the guests address shows up automatically. Well you do know that sun dials only work par time. They get time off after sunset. Interesting, this 'Live Traffic'. Do you know that it's not 100% accurate? Ste.Agathe is 13km North of where I am. Ha! Yes, Roger, I suppose even working sundials get take time off every day. Ellena, yep, thanks for pointing that out. It doesn't always provide the city either, some things just come in as Russia, United States, etc.. It was more of a curiosity to me as I've been having fun googling some of the towns and learning about places new to me. We have lived in Carefree for 15 years and love it. We live on Twilight Trail which is one street over from Stardust Lane. Venus Lane is across the street. Some other street names are: Quail Trail,Romping Road, and Here to there. It is a small town of about 3200 people. A number of artists have their studios here and every year host an artist tour called Hidden in the Hills. 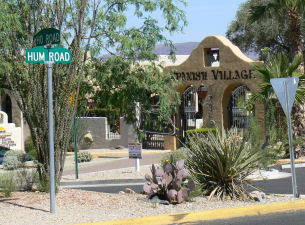 Carefree is next door to Cave Creek, a more western themed town. CC has one of the valley's top restaurants, Binkley's. Don't know if I live in a small town or a big village! Population 2303 - 39 square km area - Val-Morin, Quebec. I guess I live in the sticks but not sticks enough not to show up on You Tube (smiles). I believe that the largest "working" sundial in the world was an afterthought. The Solar Observatory on Kitt Peak has its light tube aligned so that gathering the sun's light is most efficient, which also happens to be the proper alignment for a sundial gnomen (?sp? ), so, they planted time stamps in the ground around the base. At least, where there is ground. It's worth a visit. Mary Lynn, thanks for taking time to identify yourself as the happy resident of Carefree. I'll have to put it on my list of places to visit if I'm ever through Arizona again. Ellena, I don't know how I'd identify your town, I looked Val-Morin up and it looks like your population has doubled in the last 15 years. If the present rate of growth were to continue, Val-Mornin would be the size of Chicago in the year 2160. Mathan, thanks for the heads up. Looks like there's something else for me to check out if I'm in Southern Arizona now too! So much to see someday on my teacher's salary. That's why I'm so thankful for the internet! Looking at your Live Traffic feed it shows me as coming in from Silverton, OR but I am physically located 55 miles north in the Aloha, OR area. My ISP is Frontier Communications who took over from Verizon this year. It looks as though it is reporting their server's location instead of mine. I see that my 'Live Traffic' shows up as San Marcos, TX and we are in Port Aransas (both Corpus Christi & even San Antonio are closer). When we were in Victoria, TX a few days ago, it popped up as Corpus, so why not now when we are closer. Interesting, nonetheless. I'm afraid I'm a little new to the blogging thing and I don't know what you mean by trading posts. Feel free to write to me and let me know. I'm always up for sharing ideas.